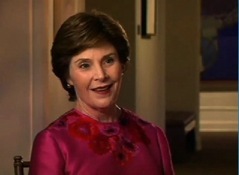 Former First Lady Laura Bush sat down to discuss her enduring commitment to fighting for the rights of Afghan women and girls. The interview is a part of the program “PUL” – a weekly public interest program, recorded in the United States for broadcast throughout Afghanistan. This groundbreaking half-hour show informs a nationwide Afghan audience about critical issues, domestic and foreign, featuring interviews with leading Afghan and American officials and experts, as well as professionals involved in fields ranging from public health to agriculture to arts and entertainment. Hosted by Mariam Atash Nawabi. The interview can be seen here and was recorded in a gallery of the Women in the Arts Museum in Washington DC. Kathi Overton and Peter Roof lit the scene and ran the Panasonic HPX170 tapeless cameras.